As a high school science teacher for the past 18 years, I’ve had the opportunity to try out a number of bags to carry the myriad of papers, laptops, iPads, and books back and forth to school each day. I put these bags through their paces and I’ve seen some pretty decent bags and some pretty awful ones too. When Thule sent me their 15″ Crossover Messenger Bag, I could tell right away that it was built with quality and durability in mind. I’ve been using the bag for most of the past school year and it still looks like a brand-new bag. The Thule Crossover is made of water-resistant, coated nylon. I have been incredibly impressed with the bag’s durability. After months of daily use, I am hard-pressed to find any blemishes on it. I’ve never used a bag that can make that same claim. One nice feature of Thule’s Crossover is its compliance with the TSA’s Security Guidelines, which means you won’t need to remove your laptop from the bag when checking in at an airport. 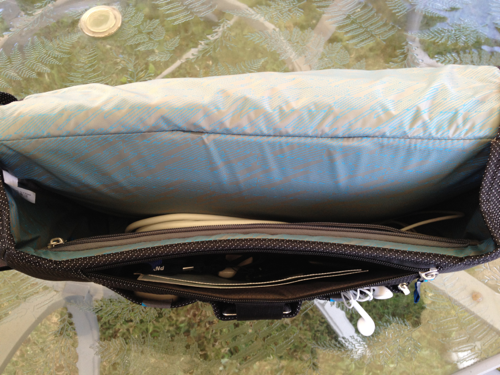 The laptop compartment unzips completely around three sides, allowing the bag to open up and lay flat. TSA Security can then get a good look at the laptop without removing it from the bag itself. 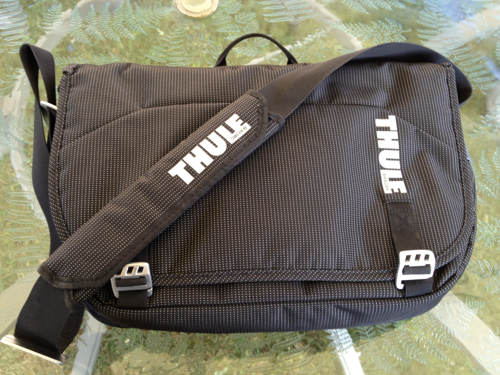 The Thule Crossover has two main compartments. 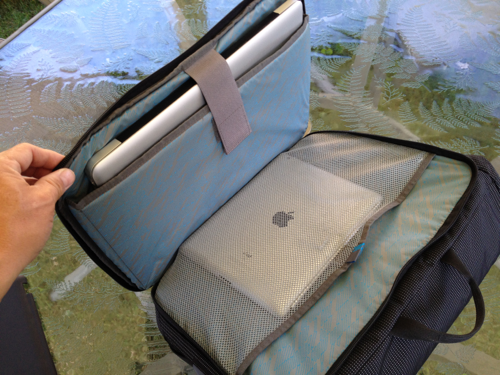 The laptop compartment is padded and accommodates a 15″ MacBook Pro perfectly. 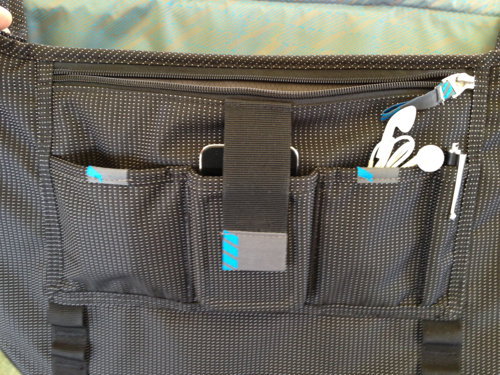 A hook and loop strap keeps the laptop in its padded sleeve securely. 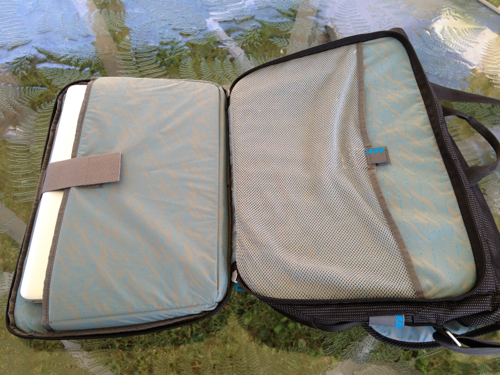 The laptop compartment also has a mesh compartment that closes with a small hook and loop tab. It works perfectly as a place to tote your iPad around in. The second compartment is a bit larger and holds just about anything you might need during the day at school or at the office. I use it mainly to carry papers and books, but it will fit water bottles and laptop chargers very nicely. 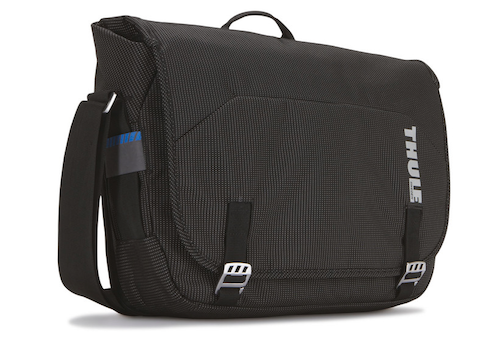 As a messenger bag, the Thule Crossover has a flap that covers the top of the bag, wrapping around the front to secure at the bottom. The latches hold well, but can be annoying to try to get in place. 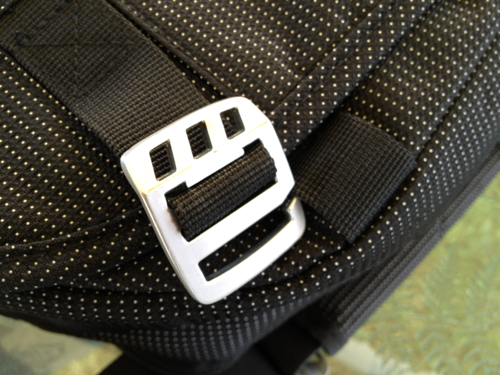 The latches are aluminum hooks that fit into a wide nylon loop that the bottom of the front of the bag. The hooks need to be fished into place at just the right angle. I believe that in order for the bag to latch securely the design needs to be this way, but it does slow me down when I’m in a hurry and rushing off to work in the morning. There are a number of smaller compartments on the front of the Thule Crossover, which are easily accessed when the bag’s front flap is opened. I particularly like the crush-proof “SafeZone” pocket that fits an iPhone or iPod Touch perfectly. A hook and loop nylon strap will hold your mobile device securely in place. There are also pockets that fit pens and styluses, flash drives, laptop and iPad chargers, etc. The adjustable, padded nylon shoulder strap is comfortable and shows no signs of wear and tear, even after months of use. It connects to the bag via aluminum tabs. Some people don’t necessarily like seeing product logos on their belongings, but the Thule logo on the strap is pretty sharp-looking in my opinion. As an added testament to the quality of the Thule 15″ Crossover Messenger Bag, it is featured on the Apple Store website. I’ve really tested the Thule Crossover thoroughly and can attest to its awesomeness. If you’re a student or professional looking for a bag that won’t let you down, the Thule Crossover is definitely worth your hard-earned dollars.